Our NY pest management company throughout the years has developed a solid reputation for customer satisfaction and has offered the most complete line of pest control and termite services the industry has to offer. Every service has its own unique approach that targets pests that can be a nuisance, damaging, or even a health threat to your family. Our services can address every individual need and concern to get the job done right the first time. Our subterranean termite baiting programs are a direct result of years of experience working with termite biology and behavior. The termite baiting system offers customers the advantage of a non invasive approach to termite control. The monitoring stations are strategically placed around the perimeter of the structure and in termite conducive areas. When termites come in contact with the monitoring stations while foraging for food, the baits are introduced to the termites and eventually reach the queen through the feeding process, eliminating the colony. Our service does not stop there. We then monitor the station around the property on a quarterly basis to establish a protective barrier around the perimeter of your home. Subterranean termite baiting program offers a unique service approach that provides a combination of advanced termite monitoring and baiting systems. Our professional technicians primary focus is to identify termite conducive conditions and termite activity. Once identified we strategically place the monitoring bait stations to establish a protective barrier around the perimeter of your home. Conventional termite service offers home owners the availability of spot treatments used in conjunction with our Thermal Imaging Camera as well as the Termatrac to maximize the efficiency of the treatment while keeping the amount of chemical used to a minimum. 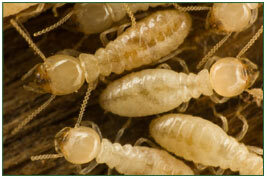 Termite damage is estimated at over 5 billion dollars in property damage each year. More than all U.S. natural disasters. Unfortunately home owners insurance does not cover property damage caused by termites. Our termite damage repair services can replace and repair all type of termite property damages. Our trained technicians begin with a thorough inspection of your property locating entry points, harborage areas and pest nesting sites. Once the New York pests are identified the technician specifically selects the most effective and people friendly materials for the targeted pest. Then the materials are placed in cracks and crevices where the pests are hiding. If you have a New York pest issue we examine the exterior and perimeter of your property we maintain a targeted treatment approach. Targeting critical pest harborage areas to create a perimeter zone treatment that will reduce insect population from around your home, when reinforced on a Quarterly basis, this protective barrier will discourage pests from harborage, nesting or entering your home. This service approach is designed to target the issues you are having with the pest in New York and minimize the unnecessary use of materials. When it comes to the interior pest control service we think of safety first. We specifically selected the most effective and people friendly products available. We apply the products knowing that pests seek refuge in cracks and crevices. This minimizes any contact other than for the targeted pests. Hi-tech inspection services offers the most advanced inspections for your property. For years, the pest control industry relied on a standard practice using experience, a flashlight and a screwdriver sometimes causing to overlook pest activity that can become very costly to the homeowner. Scientific takes it one step further using the latest in infrared and microwave motion detection technology. Using these tools and our experience we can quickly locate conducive conditions and pin point pest activity not visible to the human eye. Scientific hi-tech inspection services offers the most advanced inspections for your property. For years, the pest control industry relied on a standard practice using experience, a flashlight and a screwdriver sometimes causing to overlook pest activity that can become very costly to the homeowner. Scientific takes it one step further using the latest in infrared and microwave motion detection technology. Using these tools and our experience we can quickly locate conducive conditions and pin point pest activity not visible to the human eye. Scientific uses Termitrac a microwave motion detector that can penetrate and pinpoint pest activity through wood, sheetrock, marble, ceramic tile, and other common construction materials found in homes. This inspection tool facilitates the accuracy of treatment. Scientific also uses an infrared (IR) camera to provide a gross overview of the structure inspected. The IR camera can quickly detect temperature differences (cold or hot spot) areas that might suggest the presence of hidden moisture, termite activity, critters, insulation problems and other anomalies. Rapidly detect moisture in walls, ceilings etc. Scientific exterminates rodents, bees, termites, ants, and many other nuisance pests. 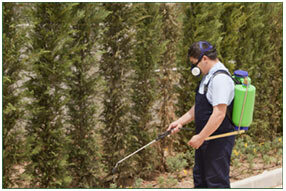 You can read more about us and the pest control services we offer. Please look at our pest control FAQ for further information on the pests we exterminate. 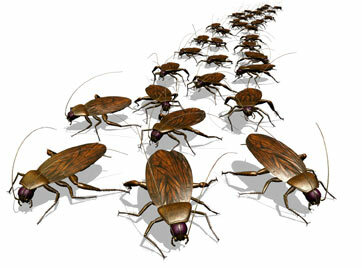 Call Scientific for help with pest control in New York at 631-265-5252 or use our email form and contact us today.